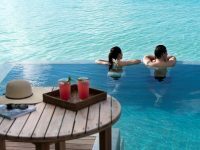 Maldives.net.mv – Imagine walking towards the rest of your life over a glass-bottomed aisle, serenaded by ancient turtles and kaleidoscopic fish. 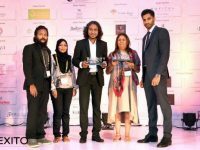 Launched in December 2015, Four Seasons Resort Maldives at Landaa Giraavaru unveils its most breathtaking bridal backdrop to date: a new “floating” overwater pavilion that elevates the beach wedding concept to a spectacular vantage point, allowing couples to pledge forever above the infinite life and endless beauty of a UNESCO Biosphere Reserve ocean. 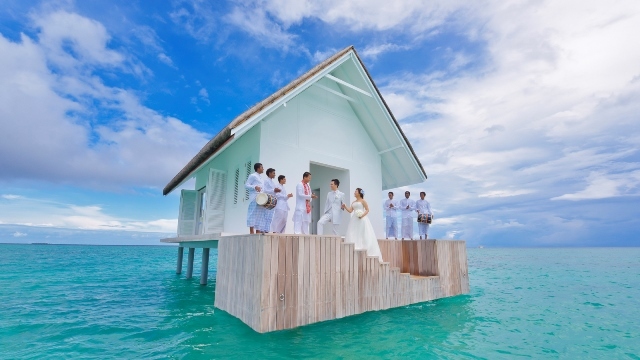 Located off the northeast tip of the island, accessible only by boat, the overwater Wedding Pavilion is a freestanding, pillared structure: light and airy with lofty vaulted ceilings (maximum height 6 metres or 19.7 feet); shimmering titanium-polished concrete floor with glass bottom “aisle” that’s above a turtle enclosure; and wrap-around, bi-folding floor-to-ceiling glass doors to three sides, opening onto timber decking. 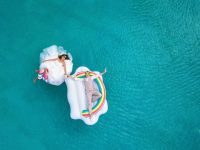 It’s a sublime 45 square metre (484 square feet, or 10.2 by 7 metre/35 by 23 feet) space that embraces the bridal couple – and up to 16 guests – in nature’s eternal energy alongside everlasting ocean views. While nature might be the only décor needed, couples can choose to personalise the space with flowers, candles and billowing fabrics – and select their nature-inspired colour palette, whether dreamy daytime blues or sunset scarlet hues. 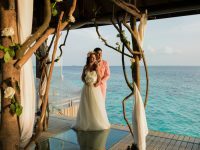 The Resort’s Wedding Coordinator can help couples plan every bespoke detail of their day.